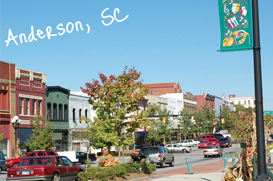 Named in 2000 as the “All American City” Anderson is the smallest of the Tri-City metro areas in the Upstate of South Carolina besides Greenville and Spartanburg. Named after Revolutionary hero Robert Anderson and ceded to the state in 1777 by the Cherokee Indians, the settlers, mostly Scots-Irish, started a plethora of farms and mills and established Anderson as a key trade route from Atlanta to the east coast. Anderson also is nestled on the shores of one of the Upstate’s largest lakes, Lake Hartwell, which provides not only electricity for the area, but is a huge recreation destination for the area. Fishing, jet skis, motorboats and various other water activities can be enjoyed nearly year round. Just down the road in neighboring Oconee County is the prestigious Keowee Lake also open to the public. Both of these lakes combine days of entertainment and incredible vistas of both nature and high end homes along the shores. Not to be overlooked are the many golf courses open year round in Anderson as the climate is so mild through the winter. History buff’s will enjoy the nearby burb of Pendleton and it’s antebellum plantations and museums giving a glance at the South in earlier days. Not to be overlooked is the subject of talk from October through February in the Upstate which focuses on Clemson University’s athletics and academics. Located in the northern quadrant and bordering Pickens’ county, residents are famous for their enthusiasm for the Clemson Tiger athletics and superb academic programs. Clemson Orange is everywhere! Considered the mid point between the cities of Atlanta, GA, and Charlotte, NC, Anderson is a hub of manufacturing infrastructure and is home to over 230 multi-national manufacturing facilities, mostly focused on plastics and automotive supplies, which provide continuous growth and jobs for its’ citizens. Shopping, dining, arts and entertainment are in full array in Anderson. The city joins both history and culture and provides opportunities to sample a variety of top eateries, shops, a large mall and variety of theatrical venues. Anderson is a huge draw for homebuyers to the Upstate. Besides being so centrally located and just off the interstate I-85, the city is a mere 20 minute drive to nearby Greenville, or to Clemson University. The homes in the area vary from historic to contemporary, from luxury to bungalows and convenience in every direction. Anderson continues to build new construction as its infrastructure grows and the market remains stable during this economic windstorm of our country. The prices have been insulated and valuation remains strong throughout the Upstate. This is a beautiful region in the true “Piedmont” or flat shoals of the Upstate and once you visit, you may just want to call it home!